How was your weekend? Did anyone else feel like it flew by? We ran errands on Saturday morning. I got my wedding rings cleaned and inspected and then Craig looked at prescription sunglasses. I had a pretty productive day otherwise-taking care of some things with my Roth IRA, ordered a Deutsche Bahn train pass and a Coach bus pass for my mom and I to get to O'Hare and back without troubling Craig or my dad for a ride. The Europe trip planning is coming together now! My mom and I will be hopping on a plane to Berlin before we know it!! I can't wait for her to experience the beauty of Germany, Austria and Switzerland. I didn't get to the gym on Saturday, so I just took a walk outside. 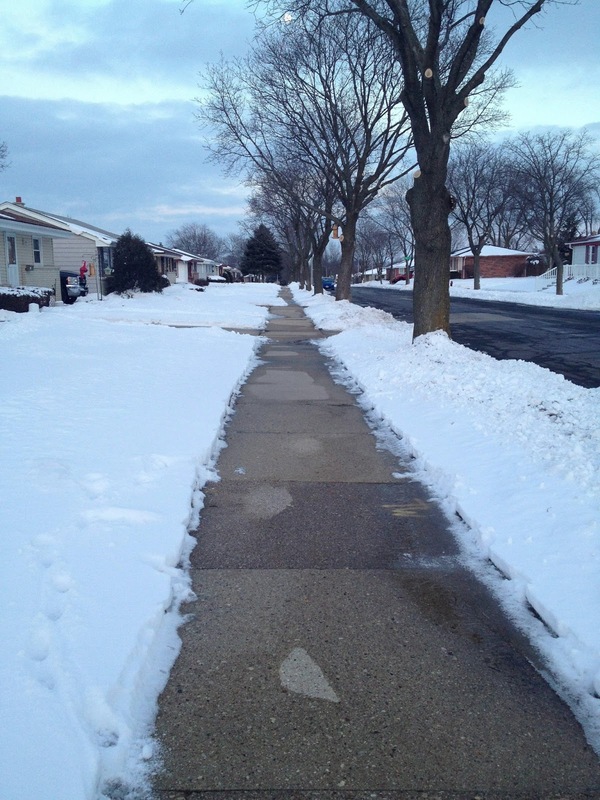 I hadn't walked around our neighborhood all winter and it felt good to get some fresh air. I just had to be very careful not to fall on any icy patches. On Saturday night, I made Spicy Buffalo Cauliflower Bites from a recipe I found on Pinterest. They turned out pretty good. I am obsessed with Frank's Red Hot sauce, so I love any recipe that uses it. I ate them while watching Vegucated. I am seriously considering eating less animal products or becoming completely vegan after watching that film. I am not sure I can give up Chobani yogurt, Half and Half and cheese though. I cried when watching the videos showing horrible treatment of animals. Our TV died three weeks ago or so and we finally found a great deal on one in the Sunday paper. We spent much of Sunday afternoon researching and bought a new one tonight after work, woo hoo! Last night, I headed to my first Oscar party at Karis's house. It was the first year I hadn't seen any of the Best Picture nominees, so when it came time to guessing who would win, I didn't do so well. Molly had seen all of the Best Picture nominees and it was fun to hear what she thought of each one. The movies I really want to see include Amour, Lincoln and Anna Karenina. Karis made tasty cupcakes and got so creative with the Hollywood sign on top. 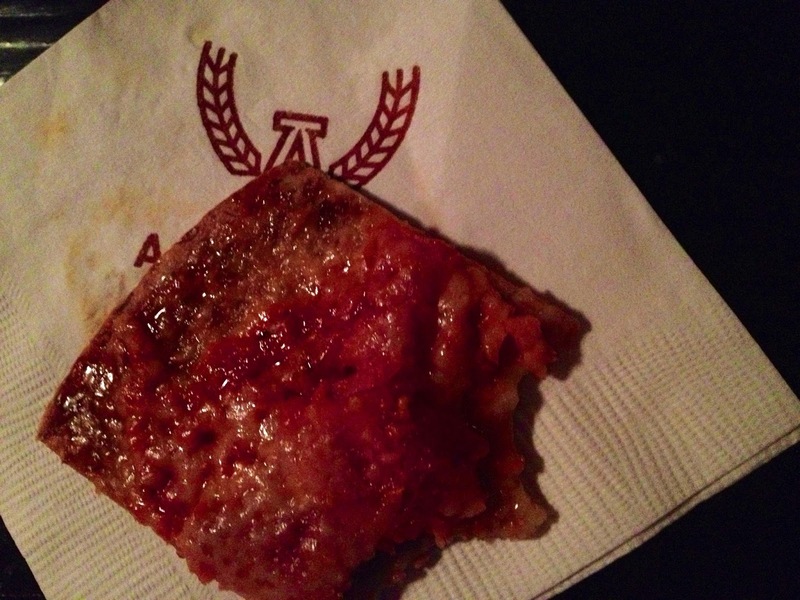 Everyone brought great food to munch on (but I wouldn't expect anything less from food bloggers)! Yummy blood orange margaritas were mixed up by Karis. And she was sweet enough to hand out prizes. I ended up with a cute Trader Joe's bag and a digital thermometer. It was fun to watch The Oscars with a group! None of us stayed until the end, but I was happy to hear that Argo won Best Picture. Did you watch the Oscars? What is your favorite movie of all time? Mine is probably Amelie. I have seen it so many times. I have been drinking quite a bit of tea this winter. 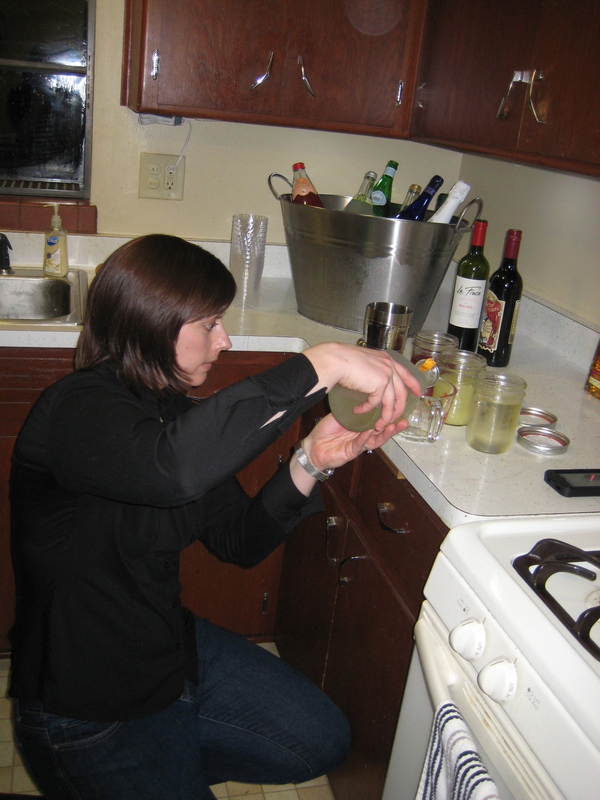 That's why it was great to be a part of the tea exchange at Karis's house last month and try out some new flavors. Here is what I tried and what I thought of the various types. I loved the pomegranate raspberry green tea from Stash and would definitely purchase it. 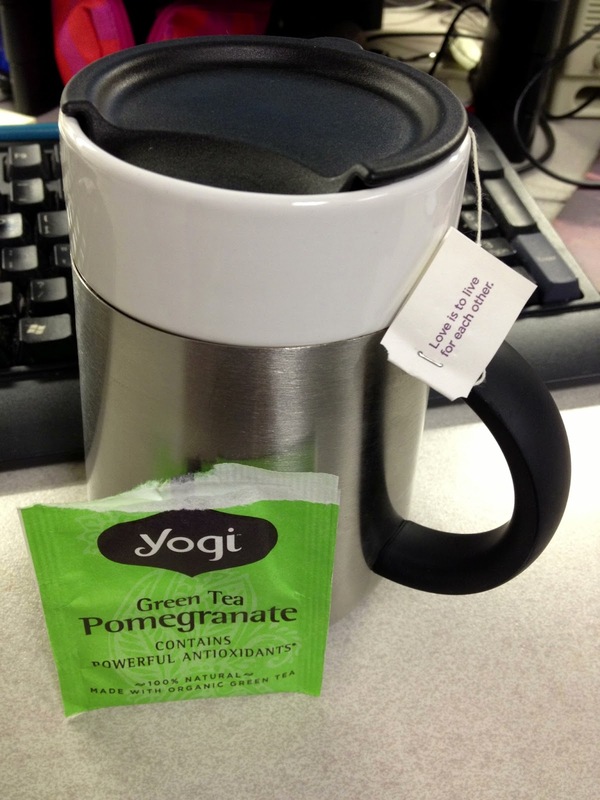 I usually don't gravitate towards fruity flavors of teas, but the pomegranate based flavors have changed my mind. I realized that Karis really likes pomegranate teas! Both of these below were great. 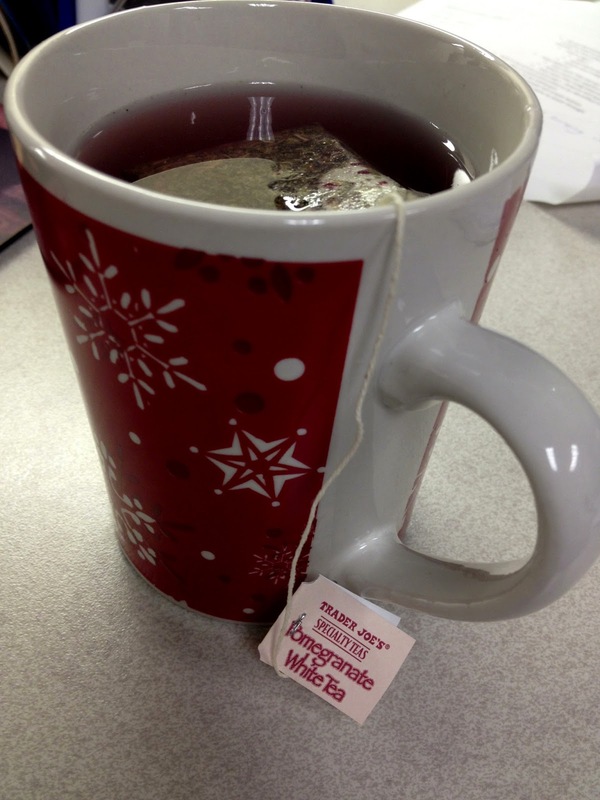 I think I like the Trader Joe's Pomegranate White Tea just a bit better though. Abby brought this Cinnamon Tempest Tea from Trader Joe's and it was the most unique flavor I tried. Love drinking it out of my special "L" cup! 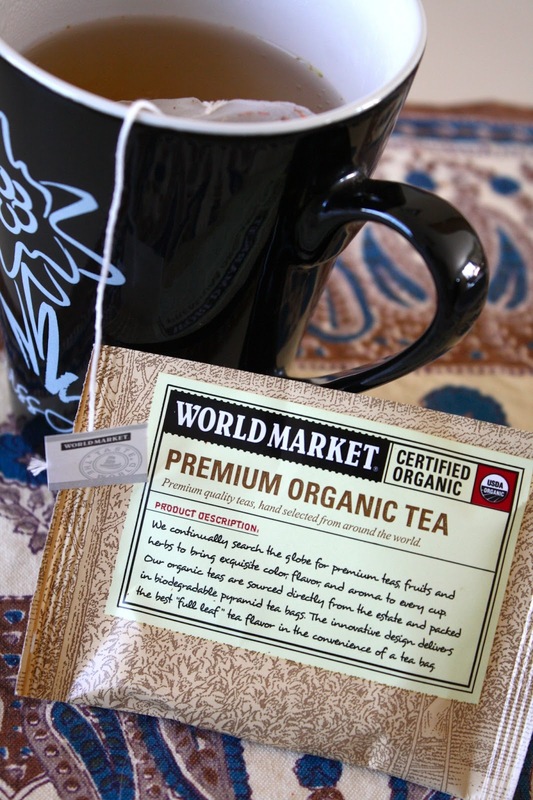 My least favorite tea was the roobios from World Market. I tried this one from Traditional Medicinals last weekend and liked it a lot. 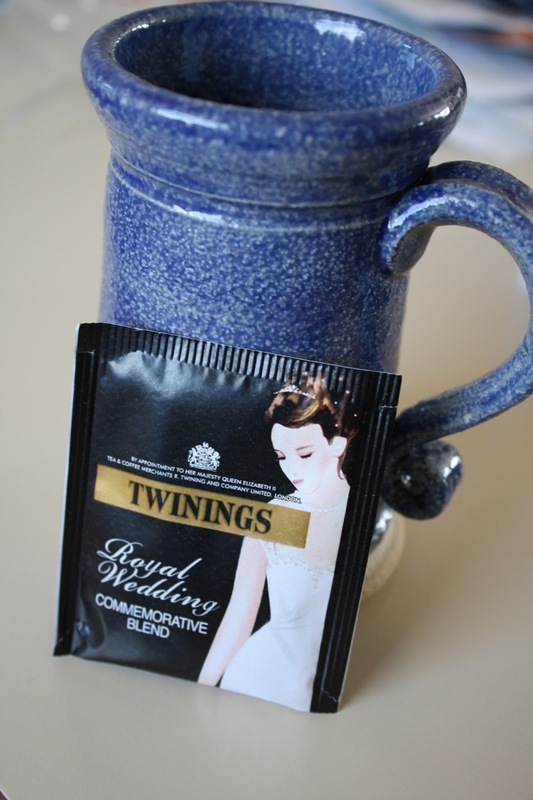 Molly brought this special Twinings Royal Wedding tea to our exchange and I loved the flavor. I even saved the packaging because it felt too unique to throw away! And finally, I tried this Trader Joe's Ginger, Pear White tea and found it to be quite tasty. 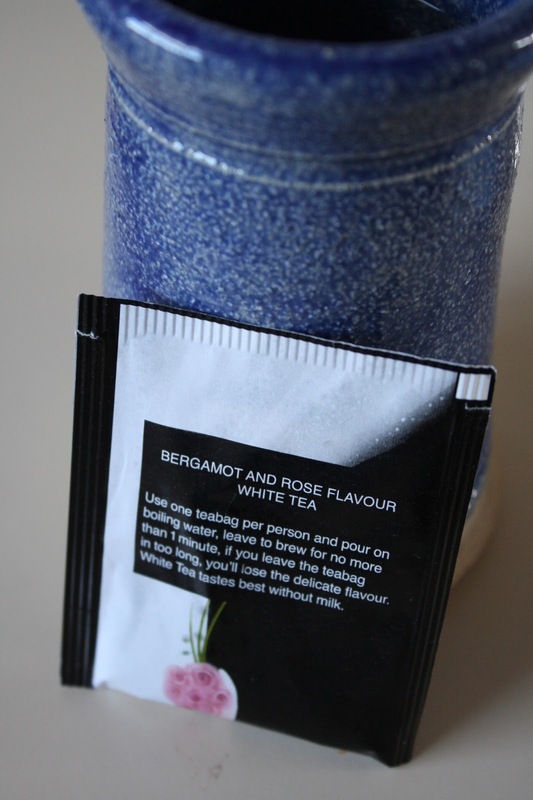 In tea news, I saw that Numi came out with savory teas, which sound disgusting to me. Carrot curry and beet cabbage--no thanks. I would drink fresh pressed juice combinations like that, but not tea. I picked up two new books at the library on Friday. Please don't laugh (like Craig did) at the fact that I got the Al Roker book. :) I really enjoy reading autobiographies where the author overcomes their lifelong struggle with weight, like Al has. So far, it is interesting to hear about his relationship with food. The Happy Herbivore is a great cookbook and I flagged about three recipes I want to try. 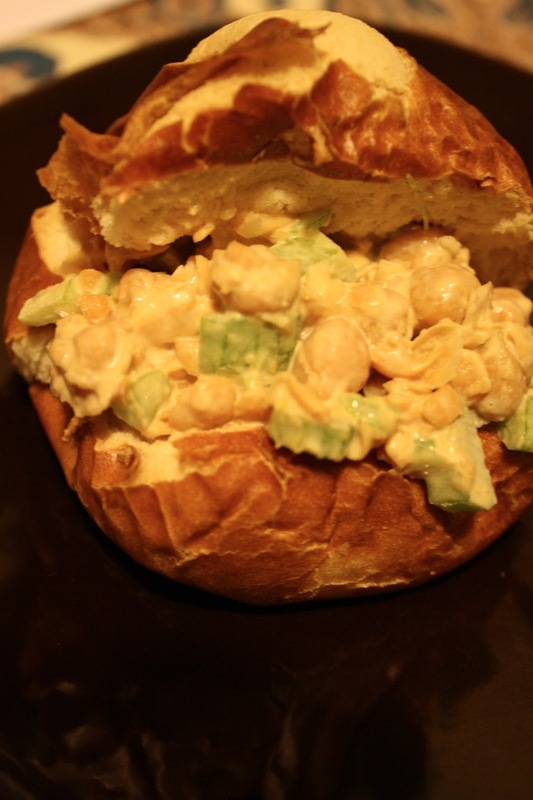 I paged through it over the weekend and found a quick recipe to make for dinner tonight. 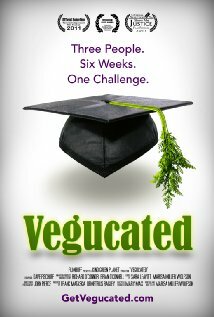 I had previously checked out Happy Herbivore Abroad from the library and I think I prefer that title over this one. 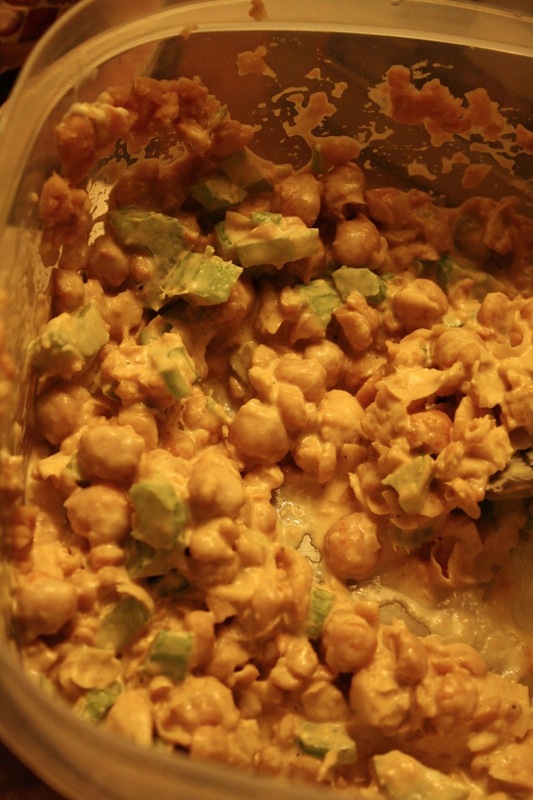 Lindsay's chickpea based "tuna" salad sounded delicious. This recipe was super easy to make. I omitted some of the ingredients I didn't have on hand, such as onion powder and kelp and I used mayonnaise instead of vegan mayo. The nutritional yeast was a great addition to this recipe. We had a pretzel bun that was on it's last legs, so I put the salad on that. It was delicious and I can't wait to have it for lunch tomorrow. After my medical appointment this morning, I checked out the Outpost Market Cafe at Aurora Sinai Medical Center. I purposely didn't bring my lunch today, because I knew I could buy it at the cafe instead. When I heard about this concept last year, I was so excited. I love the fact that healthy food is available to hospital patients, their visitors, hospital employees and to people like me who work nearby. The cafe offered a great selection of prepared foods, dairy, fruit, desserts, drinks, coffee, tea, and chocolate to choose from. 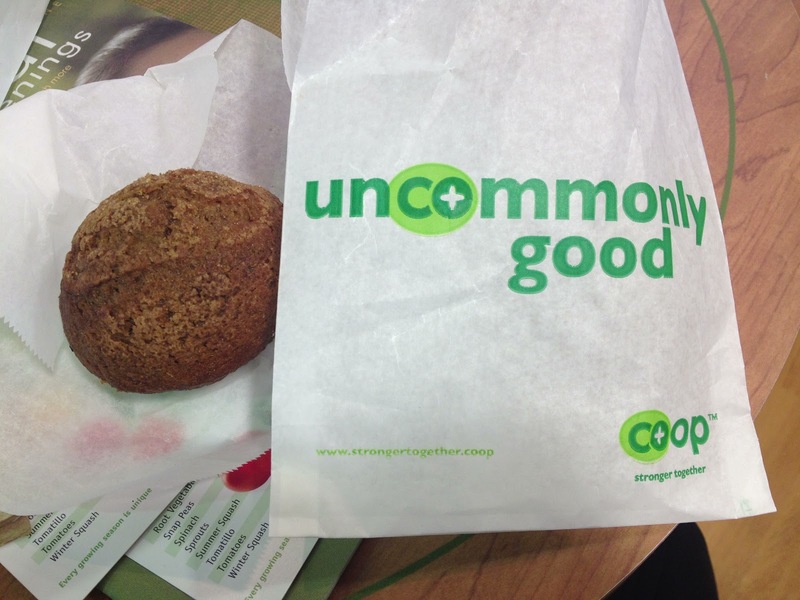 I was in need of a mid-morning snack, so I picked up a Sweet Potato muffin. It was delicious! 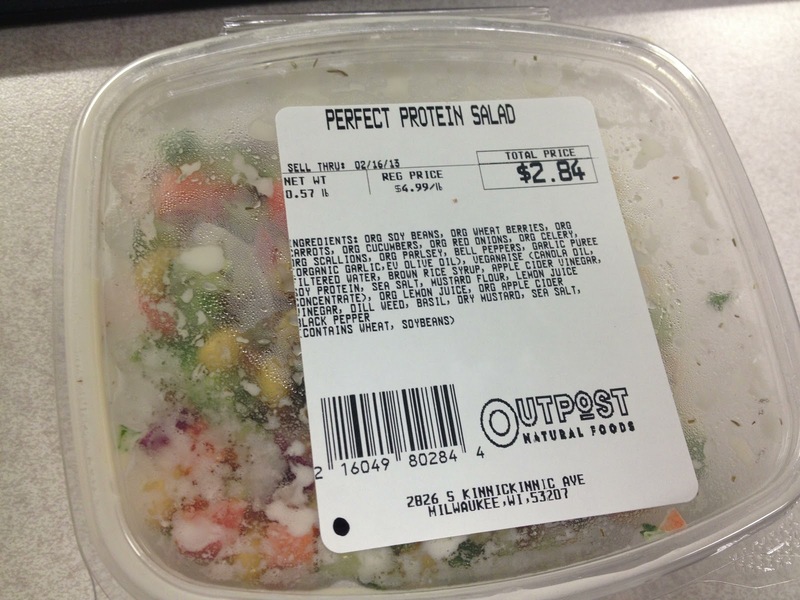 I have been hoping to make more vegetarian protein packed lunches lately, so the prepared item I chose for lunch today was a perfect protein salad. I definitely could recreate this at home. I would leave the red onions and veganaise out though and make a lighter dressing. 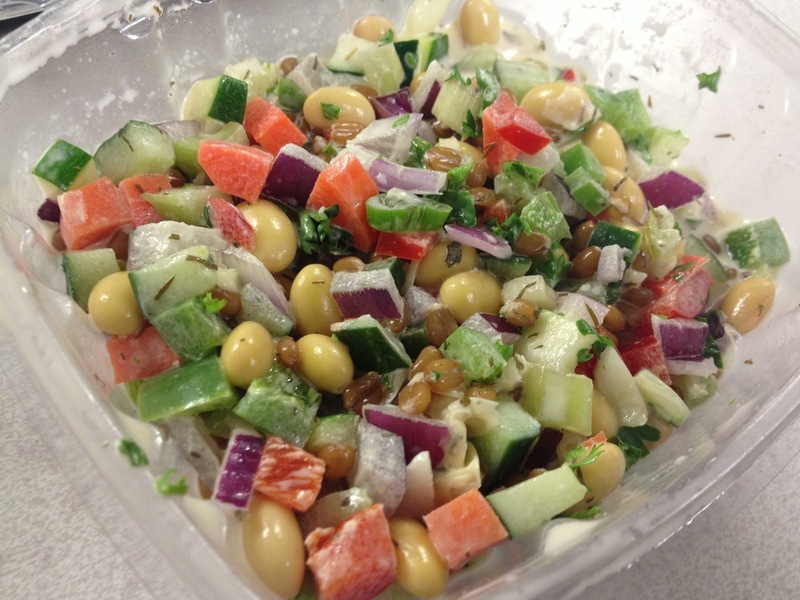 This was my first time trying wheat berries and I thought they were a great addition to this salad. By 4 p.m., I was still full and I ate this lunch at noon. I only ate half of my dessert too. My favorite chocolate bar brand was on sale and I found two new flavors to try because my beloved dark chocolate with sea salt and almonds was sold out. 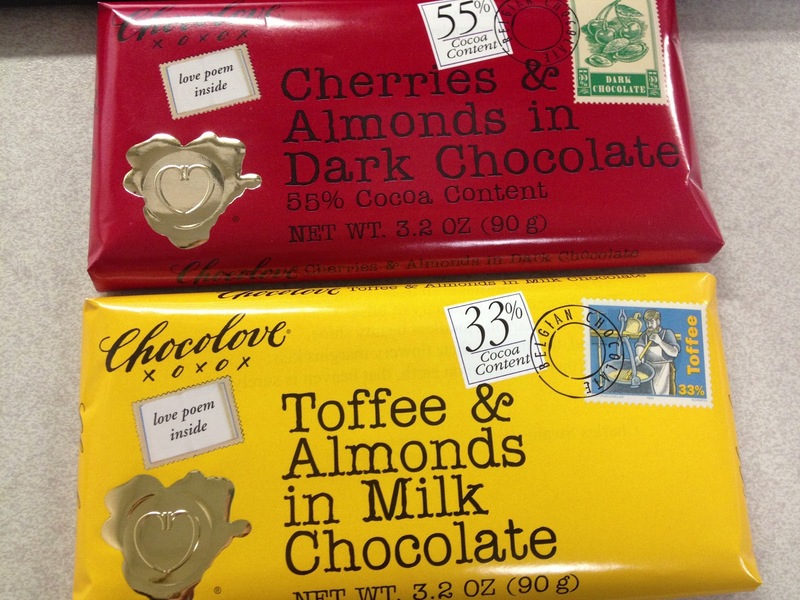 One of the Outpost employees recommended the bar with cherries and almonds. 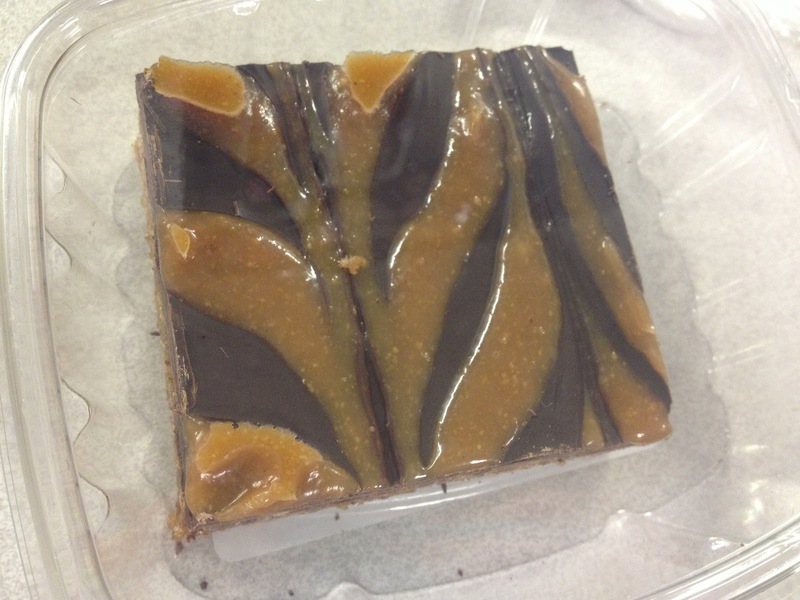 I tried the toffee tonight and it's no almond and sea salt, but it's still tasty. My actual dessert was a sheba bar. It tasted different at first, but the flavor grew on me. The ingredients weren't too bad either. The customer service I received from the two Outpost employees was excellent. I tweeted Outpost about it to share my positive experience. I will definitely be back, especially since it's not that far away from my work. I've been too quiet on the blog lately, so here are 3 things to share with you about my week. 1. I made Coconut Chocolate Chips bars from Paige's blog and they are awesome! I've been eating them as my morning snack all week. I swear that they were better after sitting overnight too. 2. I saw the "Lisa the Vegetarian" Simpsons episode for the first time and I loved it. This clip reminded me of my childhood. 3. I have an appointment with an orthopedic surgeon tomorrow morning. Last week, I had an X-Ray and MRI done and found out that I will definitely need surgery this year. I have to have my lateral ligaments shortened/tightened. They are stretched from the many times I have twisted my ankle badly over the years, especially last year. While I am not looking forward to the surgery and being on crutches for two months and no sports for 4-5 months, I will be happy if I no longer sprain my ankle in the future. I hope to get some answers to my questions tomorrow. 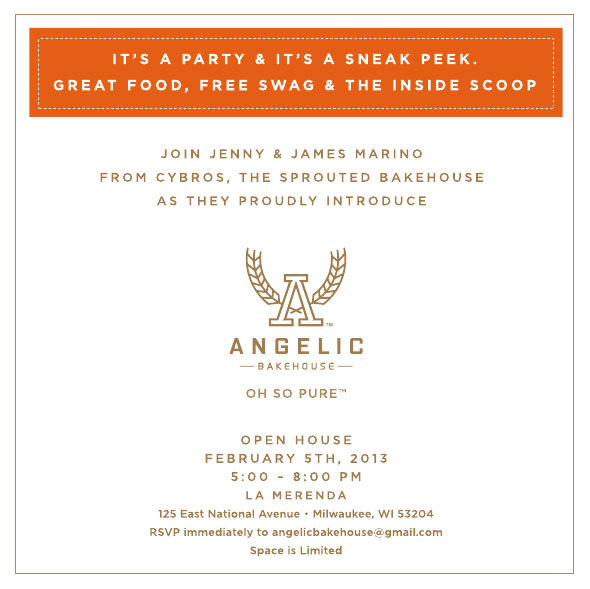 On Tuesday night, a group of Milwaukee food bloggers came out for the Angelic Bakehouse launch party at La Merenda. Angelic Bakehouse, formerly called Cybros-The Sprouted Bakehouse, are currently based in Waukesha, WI. 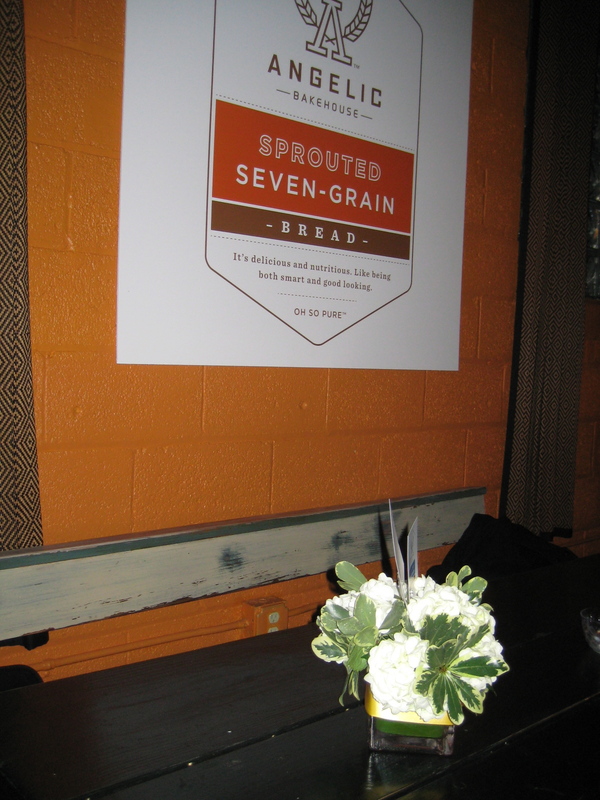 They are the Milwaukee area's only sprouted grain bakery. If you haven't tried sprouted grain bread before, a reason to check them out is because "sprouted grains don't lose key nutrients and vitamins through milling and refining." 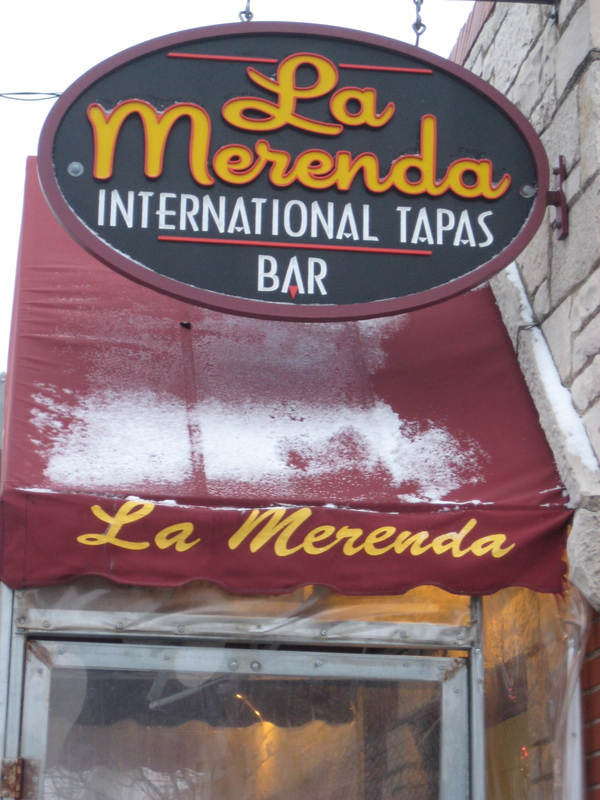 There was a recent article in the Journal Sentintel about the name change and the Marinos, owners of the bakery. We got to try various Angelic products throughout the night. Here is a crostini with olive tapenade, which was delicious. Two different pizzas were brought out and both were made on their pizza crust--the one below is Ham and Cheese and my favorite was a carmelized onion and mushroom one. At the end of the night, we walked away with swag bags. I know what I am going to get with my coupon for a free item--pizza dough (when the product is available, which should be soon). Besides 7-Gran Pizza Dough (which will be available soon), other products they sell include: breads such as Rye, 7-Grain, Wheat, No Added Sodium 7-Grain, Reduced Sodium 7-Grain and Honey Wheat with Raisins; buns and rolls such as hamburger buns, hot dog buns and dinner rolls; and speciality breads like a 7-Grain Baguette and 7-Grain Pizza Crusts. On February 6th, the Journal Sentinel featured an article about how the Marinos are looking for a new site for the bakery and will eventually expand. They included a nice description of the company's products: "Angelic Bakehouse products use grains that are sprouted and ground to produce doughs that have no trans fats or added preservatives and use only natural sweeteners such as honey and molasses. The breads and other baked goods are high in protein and fiber and low in calories, carbohydrates, fat, sugar and sodium." Angelic Bakehouse breads can be found in the Milwaukee area at: Balistrieri Sendik's, Sendik's Fine Foods, Outpost Natural Foods, Metro Market, Metcalfe's Sentry, Good Harvest, Health Hut, Riverwest Co-Op and Grasch Foods. Regionally, their products are available at Whole Foods and Woodman's. Have you ever tried sprouted grain bread? Karis and I took a cat nutrition class in June of 2012 and I learned a lot from it. After our scare with Karma's pancreatitis and hospitalization, Craig and I definitely needed to reassess what we feed our cats, Karma and Tanzi. We went to the Animal Doctor in Muskego to pick out natural food and enzymes. This was before Karma was released from the hospital and before we spoke to his vet about food options. I just went off of the information I learned in cat nutrition class and that teacher's recommendation to visit the Animal Doctor. We ended up with the Nature's Variety Instinct, some Stella and Chewy's and Prowl dehydrated food. All of these brands were mentioned in the WCTC cat nutrition class. Tanzi has been eating the Nature's Variety and he seems to like it. We give it to him specifically because it has more crude fat than Karma is allowed. As a Christmas present to the boys, we got them a new cat scratcher from Target, which they love, but do knock over occassionally. 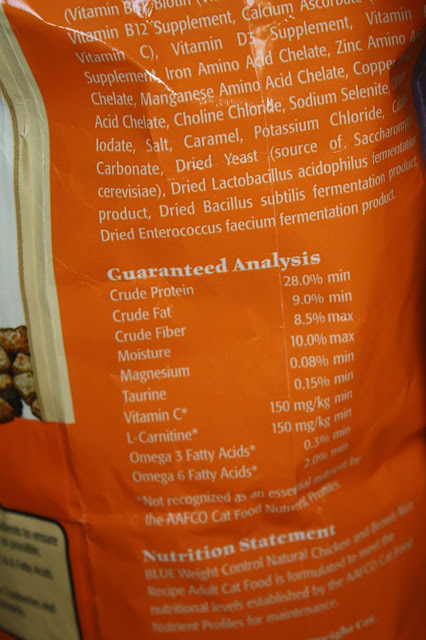 After reading up on pancreatitis, we decided that we should get some enzymes to help both cats digest their food. When we went to get Karma from the vet hospital, the veterinarian recommended buying food with 10% or less fat for him. She said this would help prevent pancreatitis from occurring in the future and that she found Wellness brand and Blue Buffalo seemed to have the most cat food types that included 10% or less fat. Karma adapted well to this new food and has really seemed to enjoy it. Tanzi also eats it occasionally and he's our picky eater. 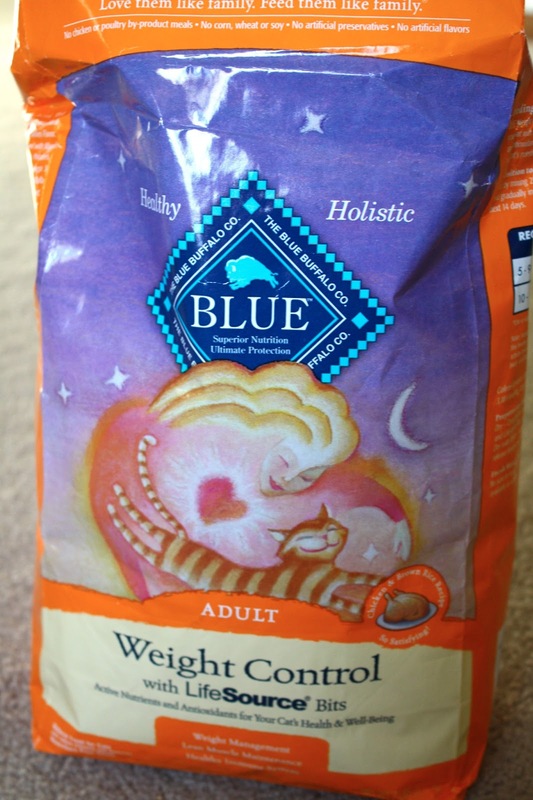 The weight control food form Blue Buffalo is the only type we found that had less than 10% crude fat. Like human doctors, Karma's vets didn't seem to know much about cat nutrition, which disappointed us. I decided to research Wellness and Blue Buffalo brands, like the vet recommended, and find a food that sounded nutritious and healthy for the boys. I feel like there should be more integration of nutrition education for vets, just like I feel like MDs should have training in nutrition too. Overall, we think Karma's food may be contributing to making him seem more energetic and playful, just like a kitten. As a pet owner who adores her two animals, I feel like paying more for food is well worth it (Blue Buffalo has some great coupons available-just request them on their website). If we hadn't made the switch, one of them could have ended up with pancreatitis again and the result would be another big vet bill to pay. Happy Groundhog Day! I was so happy to see that Phil did not see his shadow this morning and that we may have an early spring! I really dislike winter. 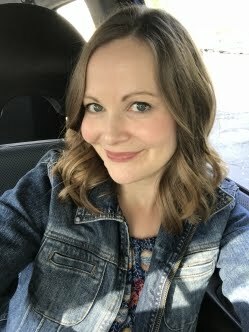 I think I am a much happier person in the summer, when I can eat lunch outside, get enough Vitamin D3 through the sun and not a pill, I can take walks with Craig around our neighborhood, bike and play tennis. Before I left for work this morning, I posted a Facebook status that said, "Hooray, no shadow = early spring." My cousin agreed with my statement, but my niece did not. My niece loves winter sports like ice fishing and snowmobiling. She embraces her Minnesota weather and enjoys winter sports. I do not. I am a horrible skiier with two bad knees, don't like fishing and can't stand being cold in general. To get through this winter, I keep picturing myself during the summer months. 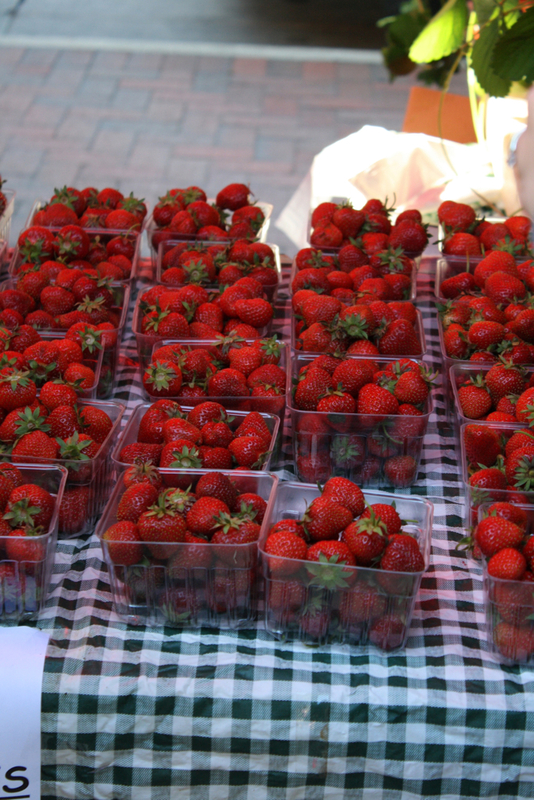 I foresee the summer of 2013 being one in which I visit the farmer's markets more often to buy things like these gorgeous strawberries below and support local farmers.